Where's the money from adoptions and sales? National Wild Horse and Burro Program Lead. Anonymous is correct in their complaint of American Herds not fully describing the scoping process for the Callaghan Complex wild horse removals, at least on paper, and it exciting to see someone wants more detailed information on how the whole WH&B Program and processes works! As a result, American Herds wants to seize this opportunity and has added a new section called Official Resources, which provides links to laws, regulations, statistics, and more as well as a written description of how public management processes work, including what a Scoping Notice covers. Click Here to view. In regards to Anonymous’s statement that the public was not restricted to supporting two options, in theory, this is also true. Due to the large amounts of proposals all issued at the same time by BLM, the shortest version of the proposals were given due to time constraints and concerns of overwhelming people who may be interested in providing input. However, regarding the two options cited in the Callaghan Complex scoping proposal, the reality is, BLM is required by law to remove wild horses once their population exceeds the established Allowable Management Levels (AML) and as such, this is the first option presented by American Herds under the Callaghan Complex “choices” because it is a requirement, not a choice. While BLM may postpone the removals to a later date, they have no legal authority to NOT remove wild equids once they have been determined as exceeding their AMLs. 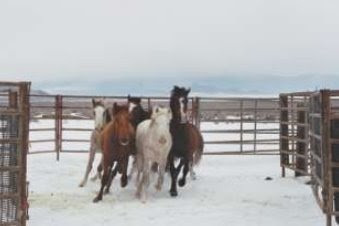 The second option was based on what BLM identified in their own Scoping Notice, which was to treat mares returned back on the range with the fertility control drug PZP. BLM as well as American Herds also mentioned the consideration of a trapsite adoption and since this was all that was provided by BLM in their own notice, it was duly passed on to those who may be interested. Furthermore, while the statement of the public providing a “better idea” is technically accurate, the better idea is restricted exclusively to a better way to remove wild horses or how they will be managed when they are returned. BLM must remove the animals, so any discussion about asking them NOT too will be deemed by BLM as “outside the scope” of the proposal (as well as being illegal). 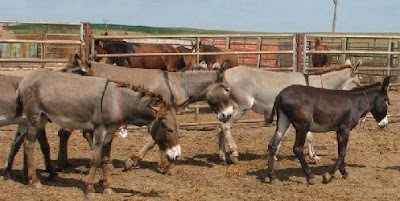 Historically, when the public has suggested or requested BLM not use helicopters to capture wild equids but to use lure trapping such as water or food or horse wranglers, BLM insists that the helicopter capture methods are the best around or the proposal area is too large to utilize less efficient and time consuming methods such as these. Other options the public has suggested in the past included partial removals, changing AMLs, reallocating forage from livestock to wild equids, changing the panel systems used in the gather pens so wild horses and burros won’t get trapped and break their legs or necks, asking BLM to provide specifics in distances run, temperature limits and freeze branding the horses and burros right at the gather pens to help make their wild horse status more visible during transport. All of these ideas BLM has either ignored, cited legal reasons these could not be part of the proposal or has “dismissed from analysis” for one reason or another. But if you would like to resubmit them again, who knows, maybe we will all get lucky and BLM will change their stance on the issues. Because it was a scoping period, the first in the series of public involvement, BLM may have time to incorporate any new ideas, suggestions or recommendations, so give it a try! Options that BLM has been supportive of in the past included fertility control with PZP on the mares, castration of stallions, different gender ratios for the remaining stallions and mares, putting state brands on federal animals, as well as branding geldings and mares treated with PZP, trapsite adoptions and micro-chipping options while the verdict is still out regarding BLMs response to requests for certain kinds of herd characteristics to be preserved. Here’s one example of how BLM treated an innovative idea in regards to the Nevada Wild Horse Range. It was suggested BLM only remove half the wild horses they were planning too during the proposed round up and then use the money they would save to fix the water systems, which were in desperate need of repair and caused an emergency situation and round up. BLMs never responded to the suggestion but the round up was cancelled completely because other areas were deemed a higher priority. However, BLM publicly stated they would fix some of the water systems as soon as the ground thawed (Click Here to view). Yet by the time the ground thawed, BLM said they now needed $150k (personal communication with NV WH&B Lead, Susie Stokke) and shortly after this, BLM released a new Herd Management Area Plan that no longer assured us that water would still be provided. (Click Here to view). Now BLM has gone back on their promise and may or may not proceed with fixing the water systems! They have listed conditions for repairing the water systems and BLM will NOT fix them if Alternative A is chosen, which continues the "existing management", even though it is on public record in the 2004 land use plans that the existing management includes fixing water systems and even adding a few new ones to boot! Instead BLM offers maintenance of water systems to be dependent on “Alternatives” that will add various population management “controls” such as castrating stallions. In another part of the woods, this could be considered extortion but not for BLM! But the truth remains, if you have a better idea about how to remove or manage wild horses from the Callaghan Complex, send it to BLM at the address below. Just don’t be very surprised if, in the end it boils down to basically two options; removals with fertility control or removals without with perhaps a gender ratio alterative thrown in on the side as has been historically the case. As for smearing BLM, generally, American Herds doesn’t have to because BLM does it themselves. When I first became interested in Wild Horse & Burro Management, I didn’t know squat about anything and truly believed BLM acted in the best interest of public resources, followed the laws and were just overwhelmed with a huge task of public resource management that was understaffed and under funded. This is still partially true too as Congress creates laws to govern public resources and then fails to fund them properly! On the other hand, BLM squanders much of the money given to them and don’t seem to demonstrate very “wise use” of their own resources. I can only “interpret” what is going on through my own experiences, of which I have had plenty of by now and it was through direct contact with BLM personnel, involvement in their proposals and researching the data, which resulted in developing a deep sense of cynicism and out right anger at the too often blatant abuse of authority as well as a betrayal of public resources held in trust for the American people and future generations that has been demonstrated all too often. Here’s a recent example that will go down in the record books as a BLM “classic”. The Ely Field Office in Nevada implemented an emergency round up of the Antelope and Antelope Valley wild horses in December/January of this year citing a catastrophic loss of life would occur due to lack of forage because of drought conditions if they did not remove the wild horses. While this may or may not be true, in a phone conversation with BLM manager Kyle Hansen, Mr. Hansen described the scene as “an atom bomb going off” on the range. Mr. Hansen was also kind enough to offer photos as evidence of the devastated rangeland conditions and of course, this was all very friendly and sounded good on paper except ~ it turned out the “current photos” were a year old, automatically dated by the digital camera when they were originally taken in 2006. The devastated range was the very “heart” of the emergency proposal and providing photos that were a year old really destroyed BLMs credibility on the issue. This is not smearing, these are facts and there are tons of other such “facts” as this one BLM has generated and continues to generate. Taking the time to research, read through mountains of documents and proposals, learning to understand the laws and regulations which BLM must abide by, and participating in those proposals is the most responsible action any member of the public can possibly take and American Herds has gone the extra step to try and share this information with others as a duty to both citizens and country instead of letting it become buried as many times BLM tries to do. In fairness, there have been exceptions and some great people in BLM too that have been very helpful and the Battle Mountain Field Office, in charge of the Callaghan Complex, has been one of the best of any Field Office worked with. But even they “approved” a trapsite adoption for the South Shoshone wild horse round up and didn’t even bother mentioning this in their Final Decision. (Click Here to read The Event, 1/09/08) Didn’t they think this was important enough to MENTION to the general public? Overall, the system needs serious improvements and historical data and articles has shown this to be true for a very, very long time ~ not just for those interested in wild horse and burro issues, but also ranchers, wildlife, and even BLM personnel themselves such as Erick Campbell and Bill Brooks, two long time managers with BLM that recently quit as a result of higher authorities deliberately manipulating their “objective scientific data” for the new grazing regulations in 2006 to support exclusive political agendas ~ my own research has proven this to be the case much too often as well. Lastly, while Anonymous states the population figures for the Bald Mountain wild horses are wrong while simultaneously failing to provide any evidence to support this accusation, the following information and contacts can verify the Bald Mountain population figures are as accurate as BLM published them. Be sure to include the EA# NV062-EA07-104 in your request. Unfortunately, this EA is MIA on all known websites. However, there is a link to the “new” gather plan for the South Shoshone wild horse removals conducted in January 2008 BLM re-submitted on December 28, 2007 and states the original Preliminary EA and gather plan was for South Shoshone and Bald Mountain HMA. This reference can be found on page 2, 2nd paragraph. If those interested don’t want to wait for BLM to mail them the EA, this is one way to verify BLM did indeed release the estimated 2007 wild horse population of 379 last April as American Herds reported. Click Here to view the South Shoshone wild horse removal final decision. Finally, check BLMs National Program Office Nevada Herd Statistics for 2007 (Click Here to view) where the population estimate given for the Bald Mountain HMA as of February 28, 2007 cited 338 wild horses, just 2 months prior to BLMs release of the South Shoshone/Bald Mountain Gather EA in April. Setting aside the fact that this EA is not available online, the question still remains from the Herd Statistic data, "How did the horses get from 338 to 607 in just two foaling seasons?" If anyone wants to do the homework, the facts speak for themselves, so the question becomes, "Who is smearing whom here?" Another wild horse capture plan is in the works, this time for the Fox Lake Range Herd Management Area (HMA) in Nevada. Last gathered in January 2005, BLM removed 370 wild horses and supposedly left 137. Yet in another Ground Hog Day moment, BLM has conducted a “new” census in December 2007 that found 331 wild horses still in the area. The Preliminary Capture Plan states that the Fox Lake wild horses have a historic reproduction rate of 19%, the Allowable Management Level (AML) of 122-204 wild horses was established for a 15% reproduction rate while the Population Modeling Appendix stated that the reproduction and mortality rates of the Fox Lake wild horses were “unknown”. Despite admitting BLM really didn’t know what the Fox Lake wild horses reproduction rate actually was, they went ahead and added a standard 20% population increase to the directly counted 331 wild horses in December, bringing the grand total up to 394. Of course, this is way over AML (as usual) and as usual, wild horses must be immediately removed to protect the drought stricken range with a capture plan tentatively scheduled for July. But back to the Ground Hog day moment…..Has anyone else noticed that prior to almost every wild horse or burro round up, a “new” census discovers way more animals than BLM knew about or has been reporting? A 20% reproduction rate applied to the wild horses left after the January 2005 removals would only produce 247 wild horses and that includes the new foals, not 394. But now there’s a 147 more wild horses than there should be, which means the actual reproduction rate is 30%, not 15%. So if the average person can figure that out, why can’t BLM? Or maybe that many wild horses aren’t really in these areas; BLM is just padding the numbers to make it seem like an emergency to remove them. Of course, that’s just too “conspiracy theory-ish” to possibly be true, even if it was BLMs own law enforcement officer making such an outlandish claim! It surely must be a coincidence that the Jackson Mountain HMA found 850 more wild horses than BLM knew about due to a “new” census right before the round ups, and the Antelope and Antelope Valley HMAs, where emergency round ups were conducted last November to prevent “catastrophic loss of life” (despite removals conducted in 2002 and 2005) jumped from 319 to 1,181 in just three years! The Bald Mountain HMA went from 379 last year to 607 this year, the Callaghan HMA should have been 542 but instead the population is now estimated as 995 and the White Mountain HMA in Wyoming, also rounded up last November, skyrocketed from 295 to 817 between 2006 and 2007 due to a “new” census too. Two livestock allotments occur within the Fox Lake Range Herd HMA, Pole Canyon and Rodeo Creek, but BLM claims Pole Canyon has been under non-use status with no livestock grazing since 1986 because a grazing management plan in 2000 stipulated a fence must be erected first. The fence was finally put up last summer and grazing may now again be authorized for the Pole Canyon allotment. Curiously though, according to grazing records, BLM authorized grazing in the Pole Canyon allotment starting March 1, 2006 through March 2016 with three different use times; 501 cattle from April 1st through July 31st, 250 cattle August 1st through September 15th, and 397 cattle September 16th through October 31st of every year. The 2000 decision that BLM claims prevented grazing until the fence was erected also issued a zero AML for any wild horse use in the Pole Canyon allotment. Alternative A - 315 are expected to be captured, 270-275 will be removed, 40 will be released and 122 are expected to remain post-capture due to all the wild horses BLM will miss during the helicopter driving. The terrain is cited as too steep to conduct water trapping so helicopters will be used. Alternative B – Wild horses won’t be removed, the range will continue to deteriorate and this alternative is illegal so BLM can’t choose it, they just included it for comparison purposes. The Preliminary EA can be viewed by Clicking Here. Thursday, June 19th, 2008 4:30 p.m. P.S.T. Be sure to include, Fox Lake Range Capture Plan, Preliminary EA# NV-020-08-EA-04 in your title and be aware that all comments and personal information may become publicly available. Photo of Fox Lake wild horse captures 2005. 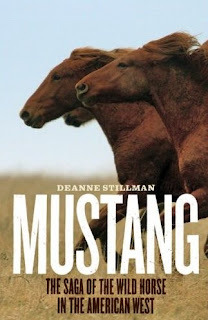 The long awaited “Mustang: The Saga of the Wild Horse in the American West” by Deanne Stillman is finally about to be released on June 9th! Of course, those on the “inside” got a sneak peak at it and here are some reviews. The Los Angeles Times also printed an Opinion piece yesterday written by Ms. Stillman titled, "Wild Horses Aren’t Free – Failure to enforce a 1971 law endangers the mustangs it was supposed to protect". Her statements are well versed in history, science, and politics and point unflinchingly towards the impending doom headed the mustangs way if there isn’t a serious turn around from the path they are quietly being herded down through officially sanctioned government actions. 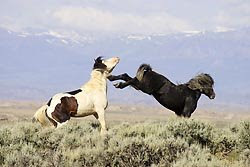 Ms. Stillman also states, “Now is the time for an immediate moratorium on wild horse removals, at least until population studies are brought up to date” and there is compelling evidence that the wild horses and burros actually still roaming free may be dramatically lower than the “officially posted populations”. For example, in BLMs recent proposal to remove wild horses in the Callaghan Complex, (see last post, Capture Calendar), just one year ago, BLM proposed to remove the Bald Mountain wild horses, one of the herds now included in the “Callaghan Complex”. In that proposal, BLM said there were only 379 wild horses and that included the spring foals. Due to funding issues, the round up was postponed so BLM issued a new proposal ~ but this year, BLM projects wild horse populations total 607! That's a 60% reproduction rate in just one year while BLM simultaneously claims the Bald Mountain wild horses have one of the lowest reproduction rates of all wild horse herds, merely 12%. In the Callaghan HMA itself, BLM removed wild horses in 2002 and mares were injected with PZP to slow down their reproduction. Even using the "standard" 20% increase BLM applies towards wild horses and not factoring in the effects of PZP at all, the population should only be 542, not 995 like BLM is now claiming. BLM has also conducted several round ups in all the areas around the Bald Mountain and Callaghan HMAs in the last few years and many of them were just within the last year. Each time, BLM reported they removed all the wild horses that were “necessary”. In other words, there was no shortage of what they took versus what they expected to take, they didn’t “disappear” and that means they didn’t migrate into these areas. These wild horses also didn't migrate into the "other" HMA either because BLM is reporting obscenely high populations for BOTH areas! Since BLM got the go ahead to reduce wild horse and burro populations all across the West, there have been countless herds reported with inflated populations and these are then suspected of being used to justify the necessity of immediate round ups due to the “immediate threat of overpopulation”. But here's the catch ~ there's no proof these populations exist besides BLMs "word". BLMs own statistics consistently don’t support the populations they say are still remaining on the range and over the last few years, residents familiar with various herds have reported that wild horse and burro numbers are so low that they can barely find them anymore. Ms. Stillman’s call for a moratorium on wild horse removals should be fully supported by anyone who cares for these magnificent animals as they deserve a place to live, both as a species in their own right as well as through their deep connection to our history, our culture and our Nation. Until current population counts are done (and NOT by government agencies that have an agenda to remove them), the round ups should stop NOW!